For at least a month now, there have been complaints in a Google Maps Help thread that Google is showing, in some cases, a single map result, when it should be showing seven map results. 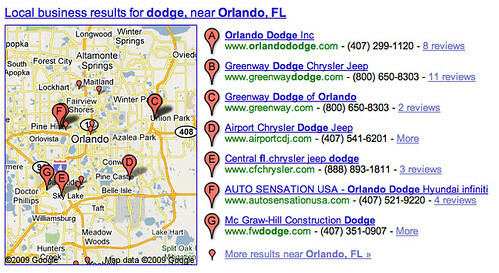 As you can see, it shows a place named Orlando Dodge, but not all the Dodge dealerships in Orlando, Florida. 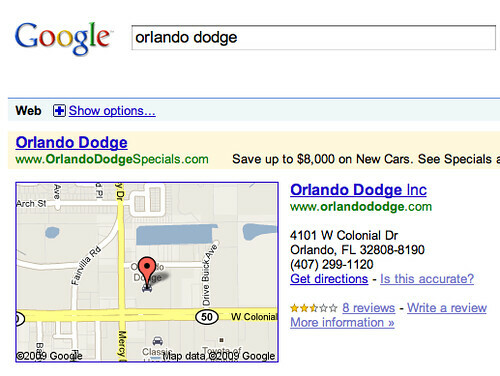 Adding on FL to the query does indeed show multiple listings, including Orlando Dodge. Thanks everyone for continuing to post examples of this issue. Hoping to resolve this shortly. Will keep you all posted. To submit more examples or discussion, join the Google Maps Help thread.